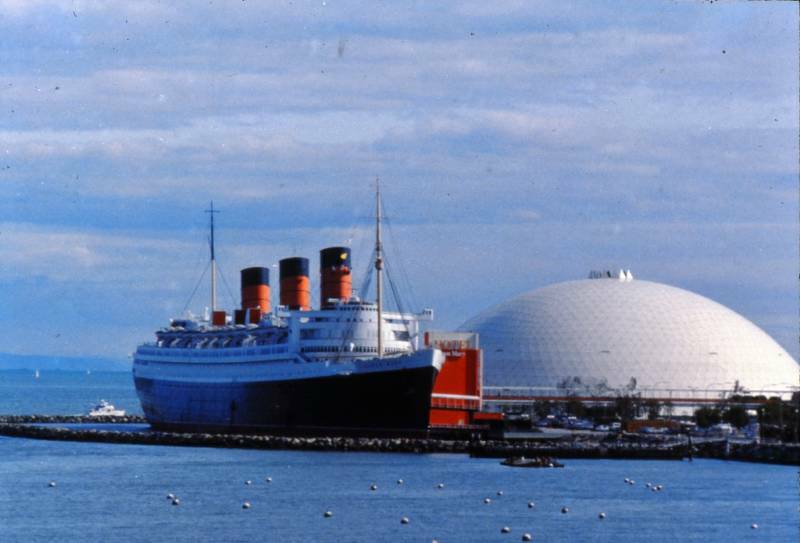 Today the ship has been part of the Long Beach skyline longer than she has been at sea as a transatlantic liner. Notice the signboard on the entrance tower along with the Russian submarine, SCORPION. A "real" bridge, full of traditional wood and brass, a thing of the past and absent in most modern day passengers ships.. 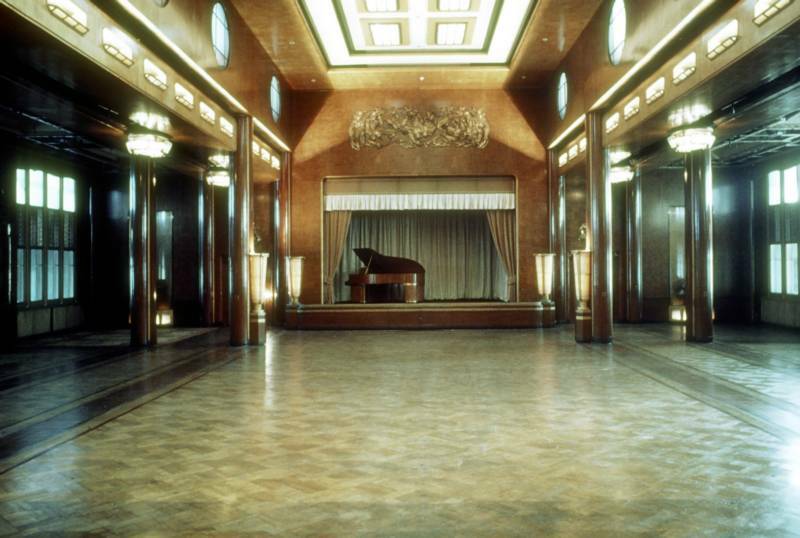 The Long Gallery as it originally appeared, located on the port side of the ship. Sussex Landscape by Bertram Nicholis is at the center of the picture. Photo Courtesy of William Cotter. Before the days of the modern cruise ship "Atrium"- the Piccadlily Circus on board QUEEN MARY, looking forward. 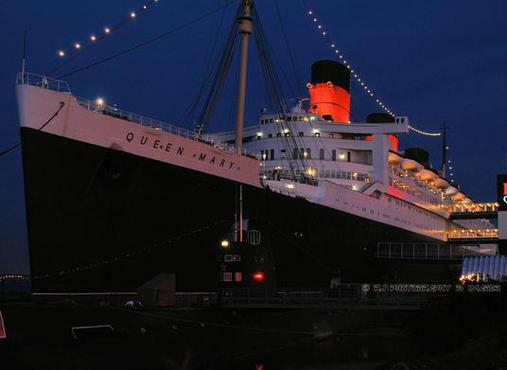 At night and the QUEEN MARY is a more magical with her lights aglow, making for a perfect time to explore decks upon decks. Looking aft towards the wheelhouse and forward superstructure, from her well deck and anchor windlass gear. The teak decks are for the most part in good condition in this area of the ship. A Teak Deck Restoration project began in 1995, with completion of the Sports Deck in 1997. Along with the Sun Deck, nearly $1 million has been spent restoring over 20,000 square feet of deck space. 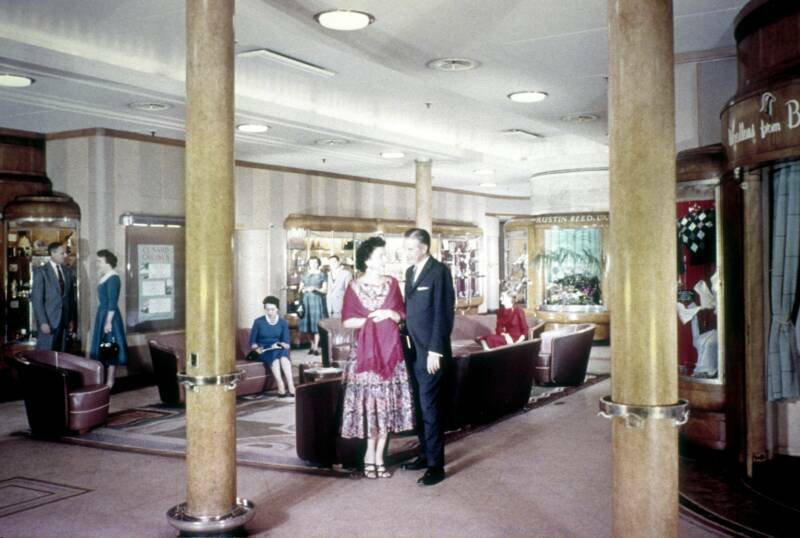 The former Cabin Class Main Lounge on Promenade Deck looking forward, stretches 30 feet high through three decks. The former Cabin Class Main Restaurant was meant to seat 815 people. 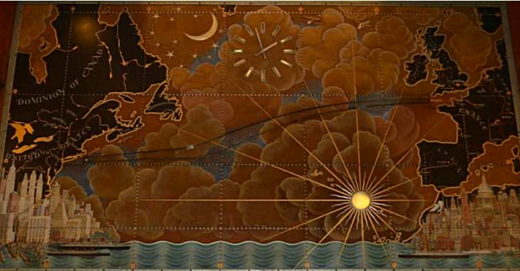 The decorative map by Macdonald Gill is in the center. 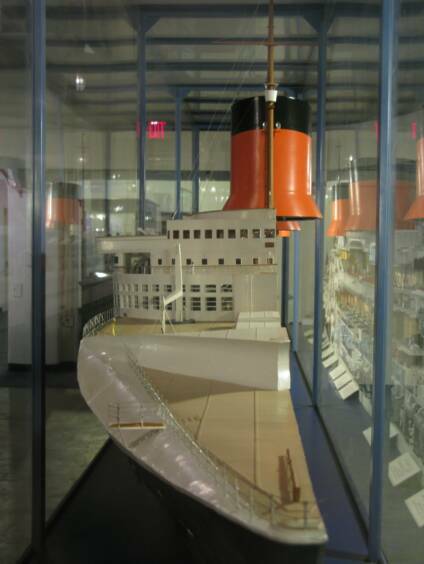 A crystal model of QUEEN MARY would 'travel' over the map indicating where the ship was during transatlantic service. Please do not copy the photos here without proper credit and permission. 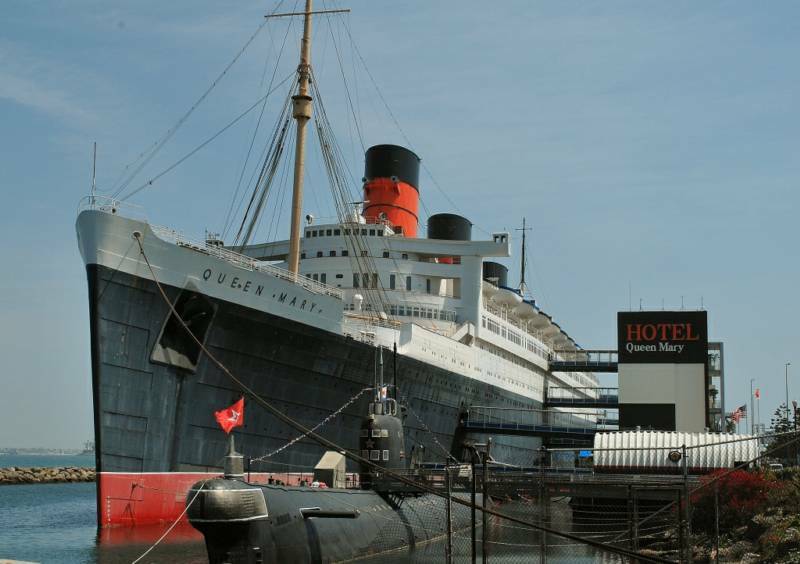 The funnels (also called stacks) of the MARY are not the originals as they were severely rusted and were replaced with those seen here before she opened in 1971. 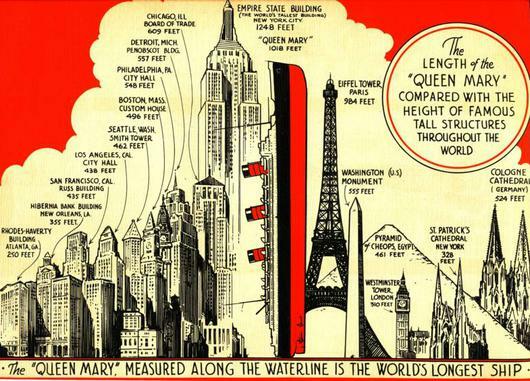 The height of the first forward funnel rises 70.5 feet from its base, the second behind rises 67.5 and the third stank stands 62.5 feet tall. 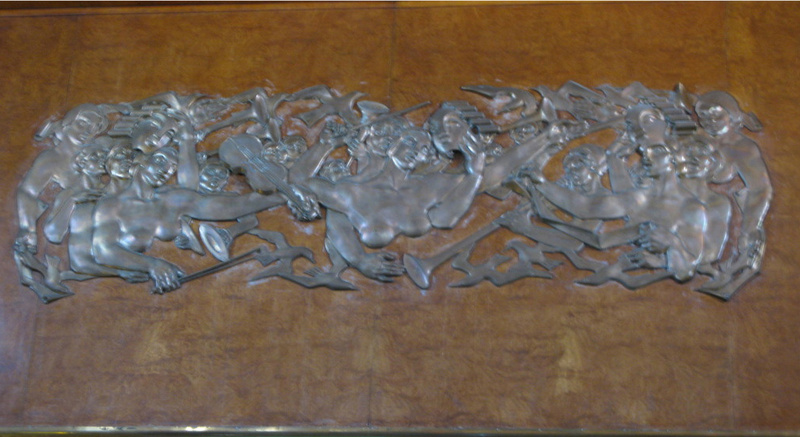 Directly over the stage in the image above is Maurice Lamberts bronze-relief panel entilted 'Symphony'. "Unicorns in Battle" by Alfred Oakley and Gilbert Bayes is a large gesso panel which frames the curved onyx fireplace below. It is flanked by two dark alabaster torchieres. Hinged doors in the panel open to reveal what used to be film projection equipment which in her years past, control the cinema room directly behind. 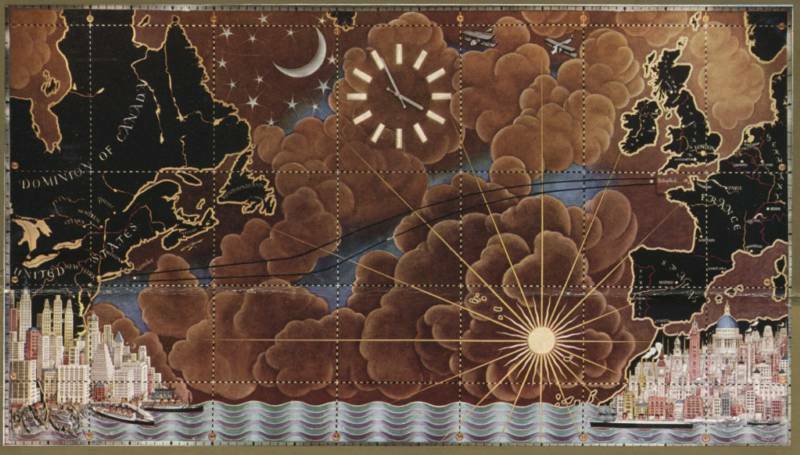 Above, a detailed image of the 15 foot by 24 foot mapas it originally appeared before her trooping dutieslocated at the forward end of the Cabin Class Restaurant on C Deck(R-Deck today). Authors collection Below, the map as it appear today. 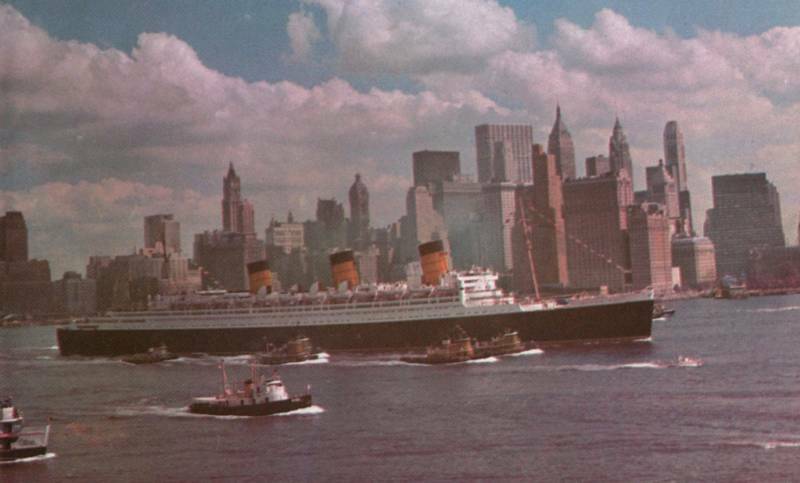 The QUEEN ELIZABETH ( located at the left on the 'New York' side ) was added later by the artist when both liners began the two liner express service in the late 1940s. 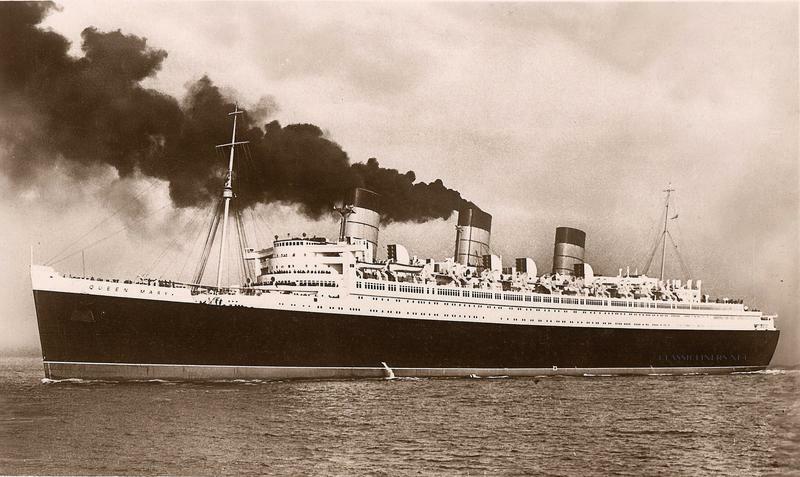 Gill also re-added AQUITANIA below ELIZABETH as she was still in service. 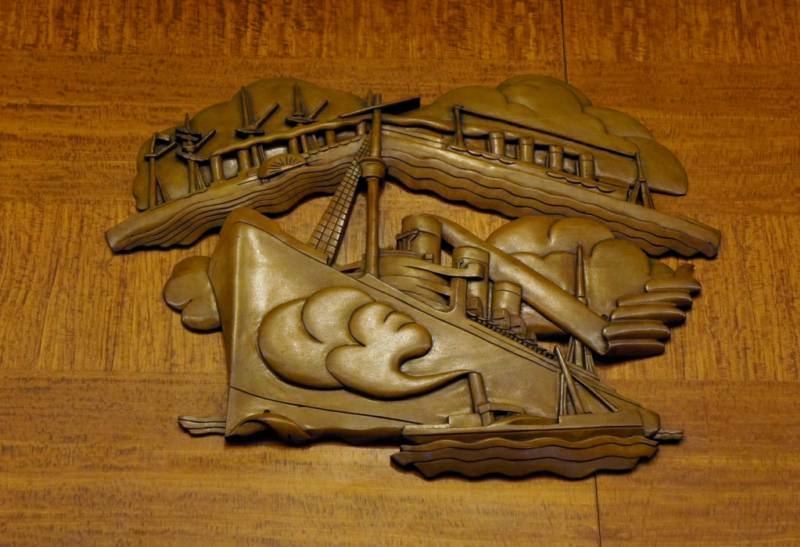 'Sussex Landscape' by Bertram Nicholis as it appears today, now located in the Regent Room. Easily one of the precursors to the QUEEN MARY is the RMS MAURETANIA, seen here in Charles Pears' painting of the liner as she heads to the breakers in 1935. That much loved ship is so iconically depicted in this painting that it is said that part of the personality of this venerable liner passed to the new speed queen in which she replaced. 'Madonna of the Atlantic' by Kenneth Shoesmith - executed on a gold leaf background - formed as an altar piece in the Cabin Class Drawing room when that room was used as a chapel. Inset, theQueen MaryArt Gallery on R Deck houses some artwork, but like this one from above has recently been moved aft on D Deck near theQueen MaryTimeline. Some sections of the aft engine room have been kept intact, a most rewarding thing to see preserved especially since this is what helped the QUEEN MARY break transatlantic speed records. Just as nostalgic to see as the engine room is the only remaining screw (out of four) on the port side which propelled the QUEEN MARY to her 31.69 knots record (36.47 miles per hour) which she achieved in a eastbound voyage in August 1938. Looking port towards the wheel house from the bridge wing. Notice the brass gryo repeater, and searchlight as well as Radio Directional Finder (RDF) above. 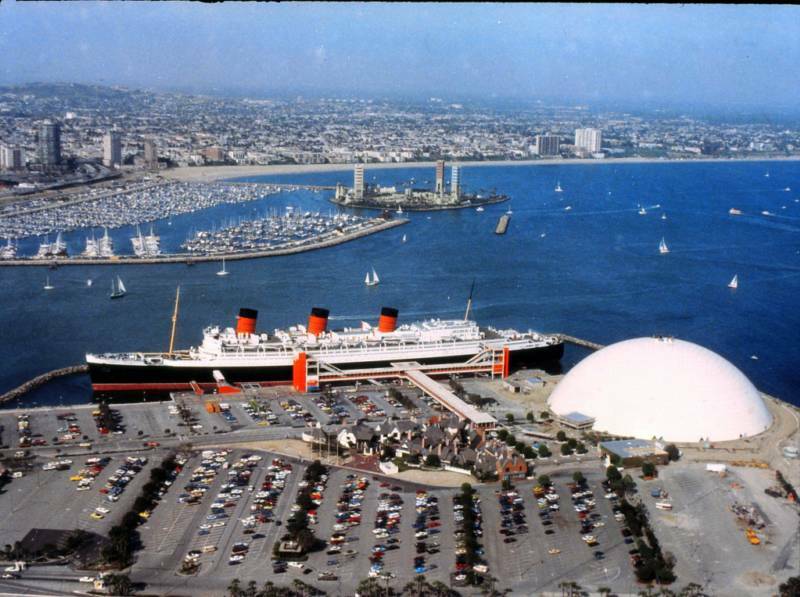 In more ways than one, it is ironic and almost befitting, that Hotel QUEEN MARY houses a 22 foot model of her greatest rival, the ever brilliant 79,280 ton NORMANDIE. She too was a speed queen, breaking the Atlantic crossing record and capturing the Blue Riband accolade when she debuted in 1935. 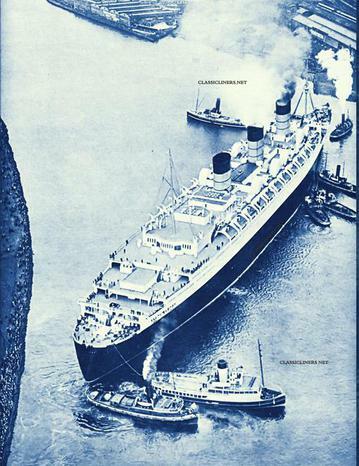 The two "Ships of State" (of Britain and France) would exchange the title and the prized Blue Riband back and forth from the onset until 1938 when the MARY won the title of fastest liner on the North Atlantic. 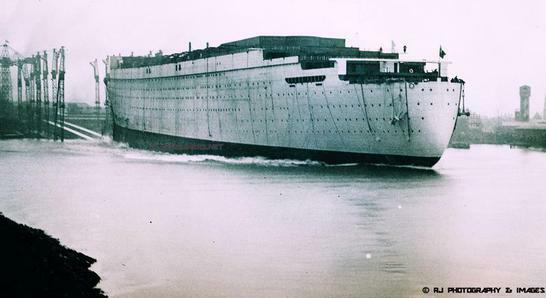 The NORMANDIE was also largest liner upon her debut, but when the British speed queen was put to see she lost that title until a later refit allowed the French liner to recapture the record as the largest, measuring over 83,000 tons. 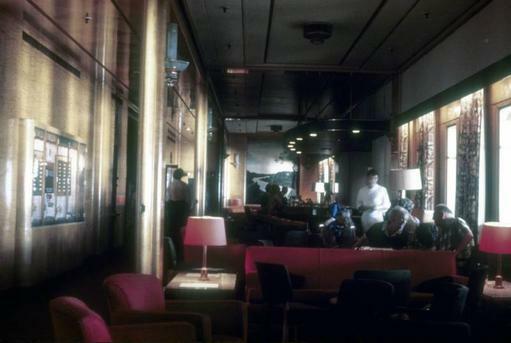 These are just a few glimpses of Roberto Pirrone's splendid model as it appears behind glass on board Hotel QUEEN MARY. 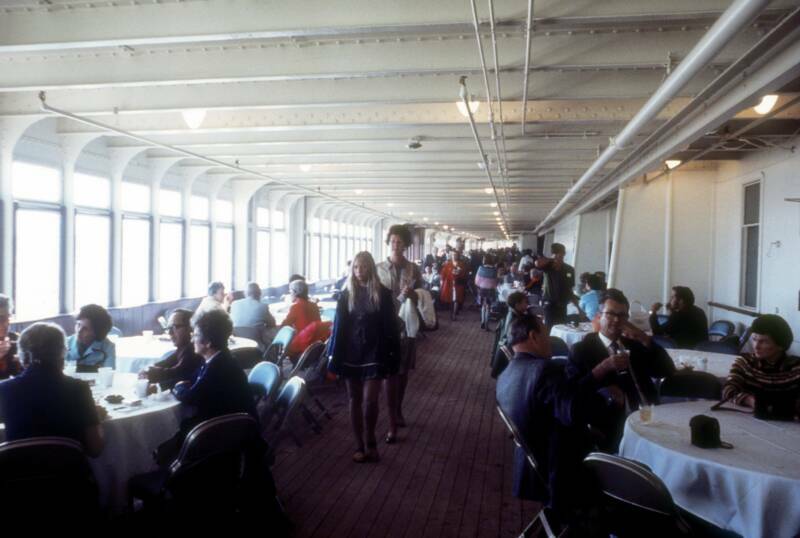 At the aft end of the Promenade Deck is the former Cabin Class Smoking Room. Now called the Royal Salon, this view looking forward reveals Edward Wadsworth 'Dressed Overall at Quay'. 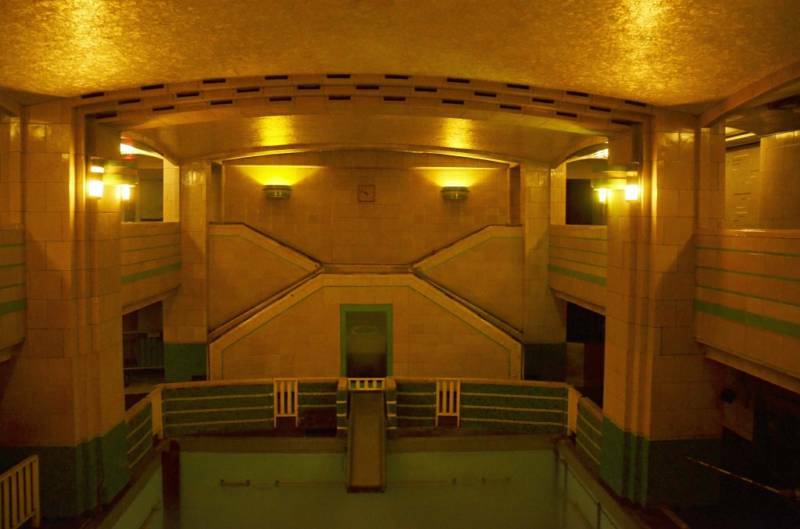 Rising to a height of 22 feet, the room also features 'The Sea,' also by Edward Wadsworth- is directly across from its counterpart. and likewise, is surrounded by dark oaks and walnuts. 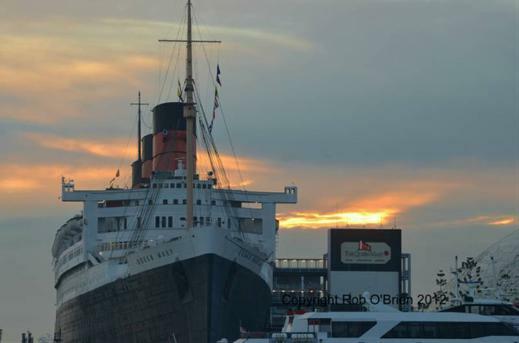 Sunrise over the QUEEN MARY makes for the perfect setting in Southern California. Notice the new signboard on the entrance tower. A distant telephoto view taken during the late 1970s. Photo by Russ Finley, Authors collection. 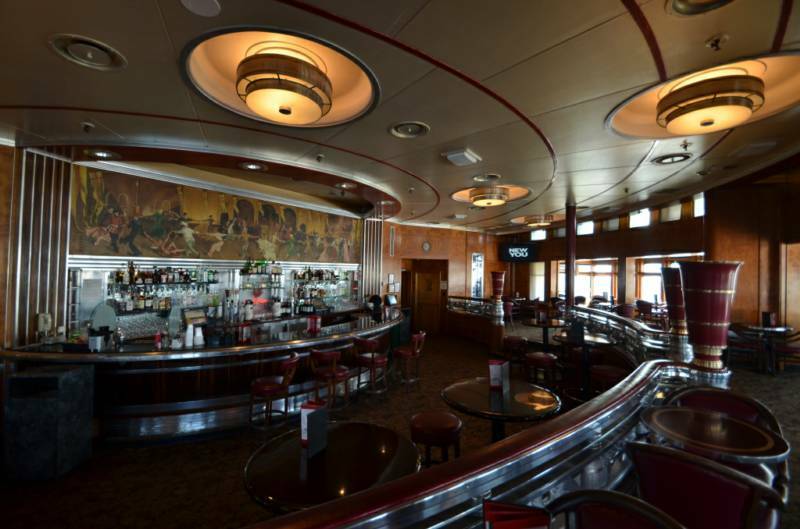 Located all the way forward and over looking the bow is the charming Observation Bar, featuring the painting 'Royal Jubilee Week 1935' by A. R. Thomson as seen over the bar. 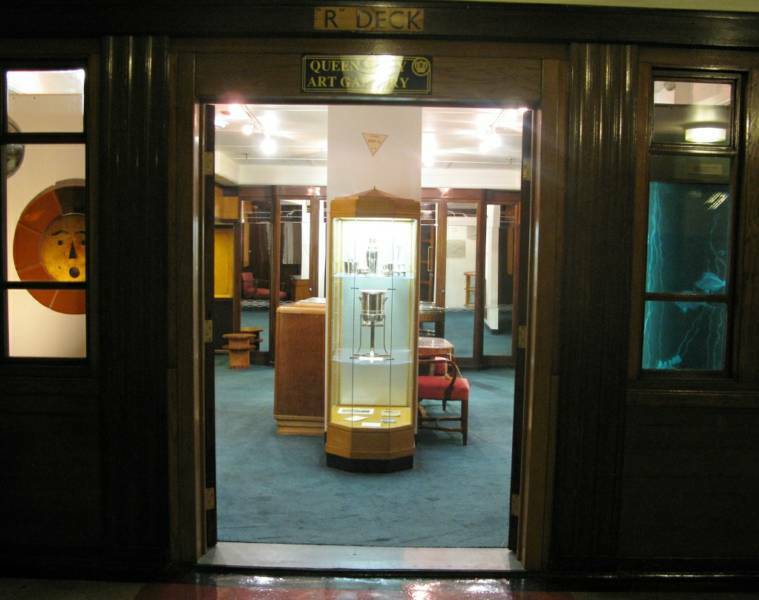 Located on the port side of the ship is the former 1st Class Library and from 2006 until January 2015 this had been home to Queen Mary Couture. The former bookcases were still being used. At this time, this space has yet to be opened up back to the public. Looking forward on the port side of the Promenade Deck in what maybe the same view to the left, the teak deck is well preserved today. At the aft end of the Grand Salon is these bronze doors, which served as the entrance to the restaurant while in liner service. They are the work of father and son team Walter and Donald Gilbert. 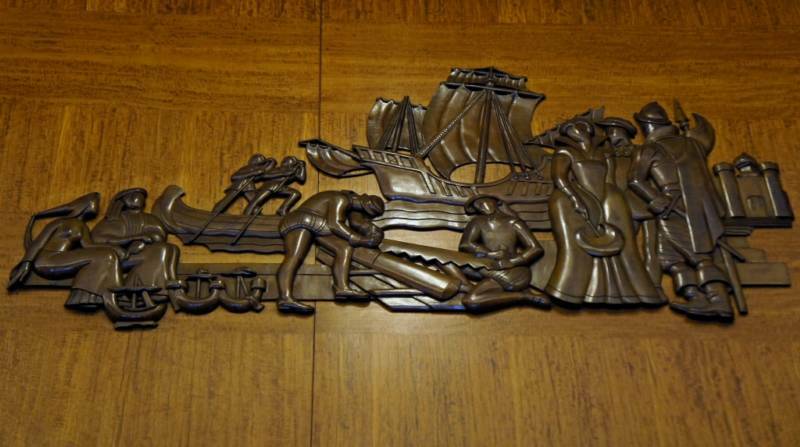 Bainbridge Copnall was commissioned to create ten carved wood-relief panels in the Cabin Class Restaurant centering around the theme, 'Ships through the Ages' The two featured here include a representation of the great Atlantic liners[above]- GREAT EASTERN, MAURETANIA & QUEEN MARY herself in the center. 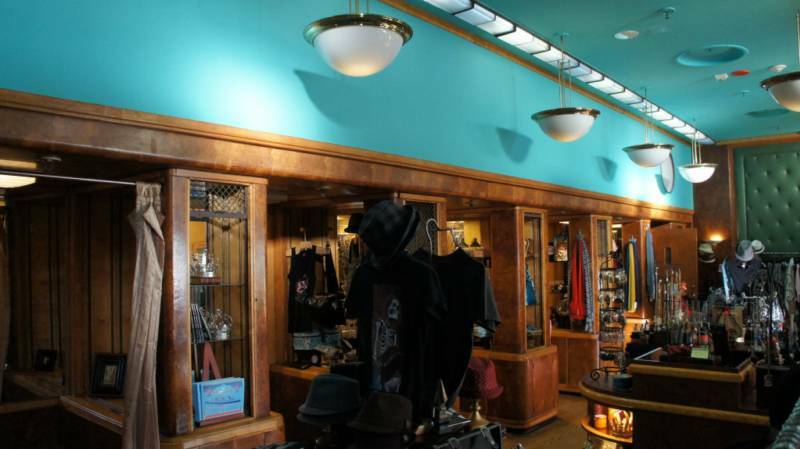 The other, below, centers around trading between Native Americans and early settlers. 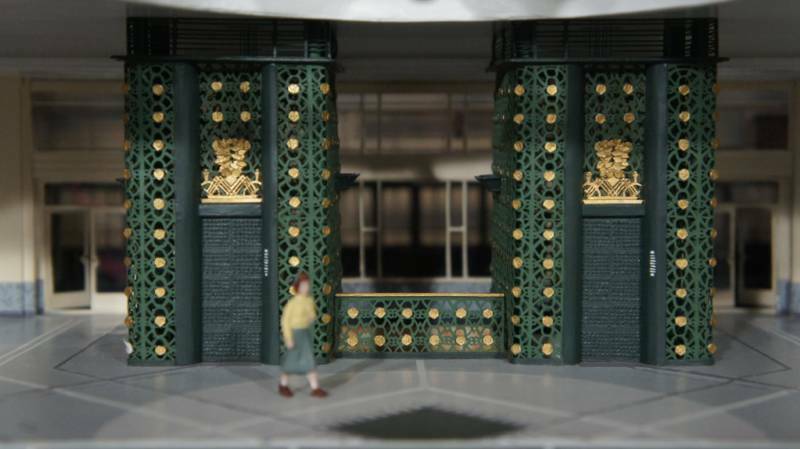 Also located on R Deck- formally C-Deck- include the former mainentrance to the Swimming Pool, at left which looks more like an entrance to a theater. 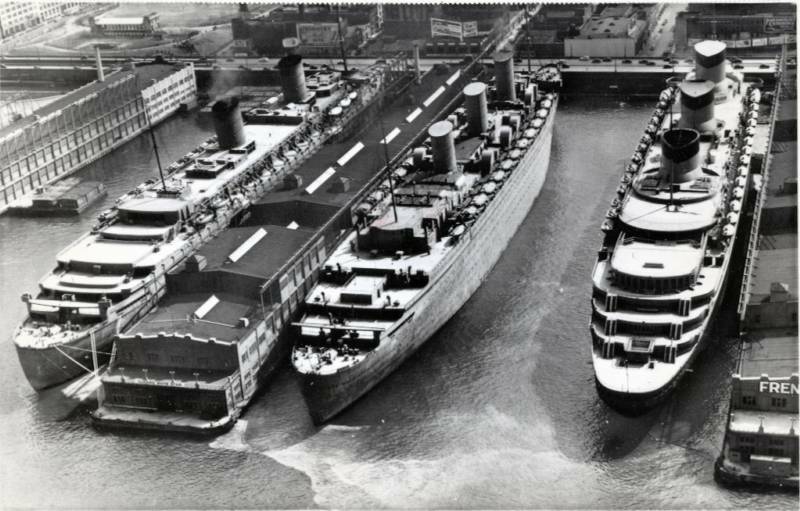 At right, the two level pool- now home to the "Ghosts and Legend" tour- looks much today as it did when the great liner was in service. 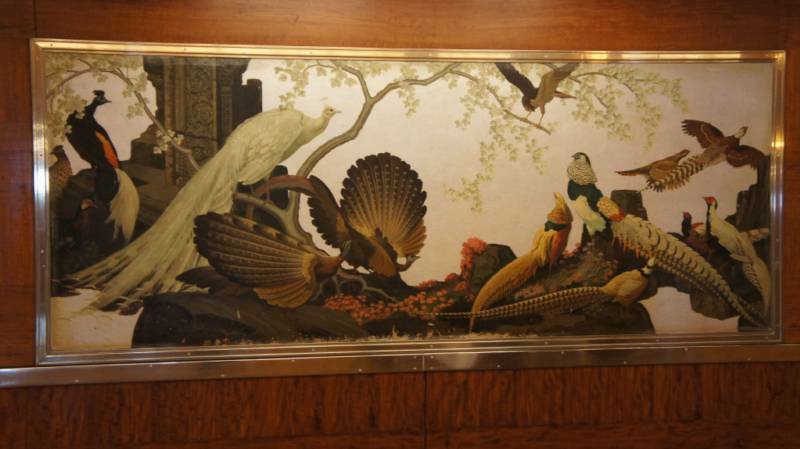 Above, 'Birds of the Old World' by A. Duncan Carse hangs in the center of the port-side bulkhead of the Cabin Class Restaurant/Grand Salon. 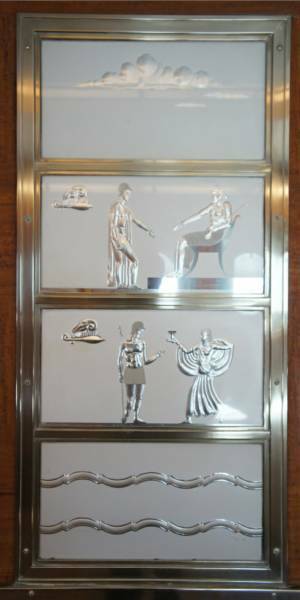 Left, one of Walter & Donald Gilberts hand engraved silvered plate glass panels tells the Greek mythology story of Jason & the Golden Fleece most of which hangs in the current day Windsor Salon on R Deck. 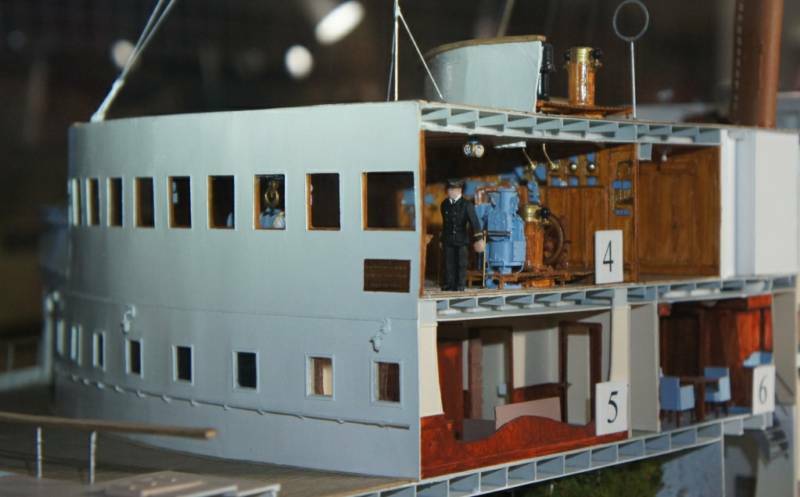 Above, a direct view of the ship showing the half model with the exterior detail on the left and the interior details on the right. Below, close-up view of the wheelhouse and forward superstructure. 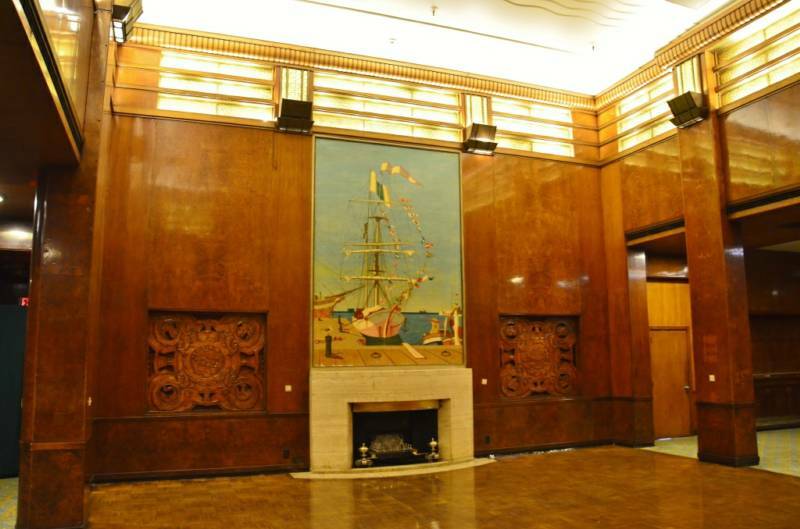 Two impressive rooms adjoined undisturbed by funnel uptakes(shafts) was not the case with many ocean liners of the age. 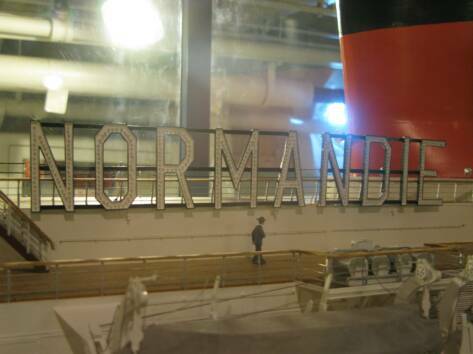 NORMANDIE broke the norm in this regard as the funnel uptakes where divided. The result was an unobstructed sweep of axial joining of public rooms that ran some 500 feet forward to aft. 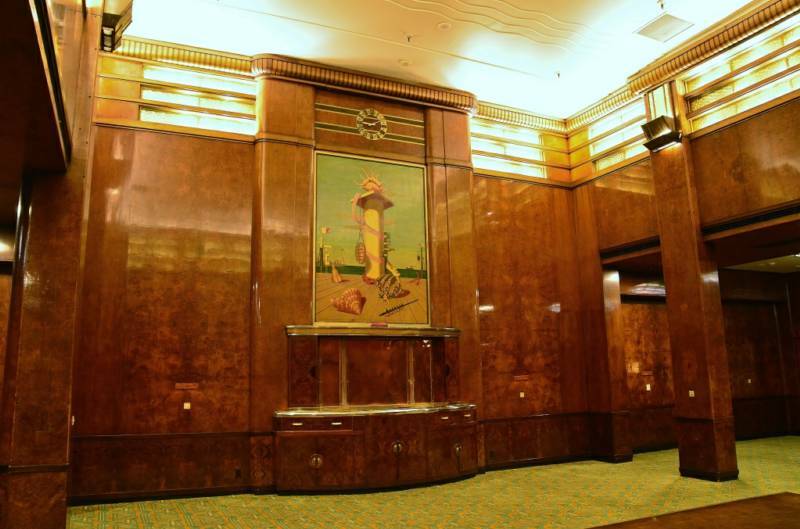 One of these rooms was, the 1st Class Fumoir or Smoking Room staircase (above) the 'La Normandie' statue is to the left at the top of the staircase. 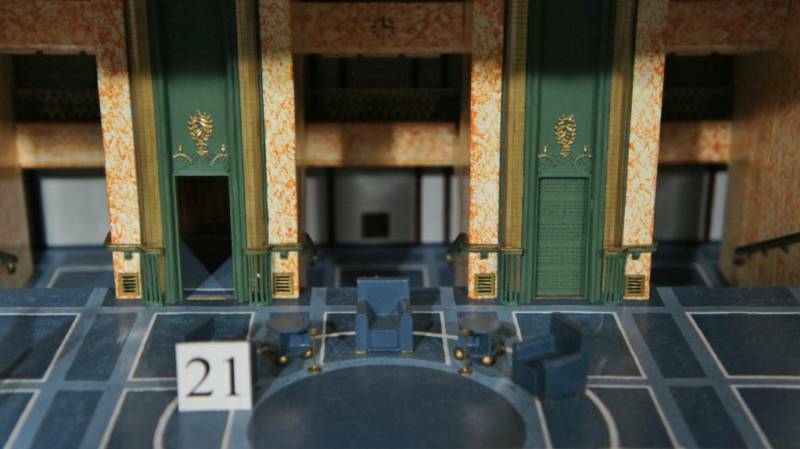 Below, the Grand Salon was perhaps the heart of this remarkable and unrivaled space. The famed Dupas panels ('Chariot of Poseidon' on the left) Labourets lighting towers and pewter vases by Daurat are two elements that add to the splendour to what this space was like. 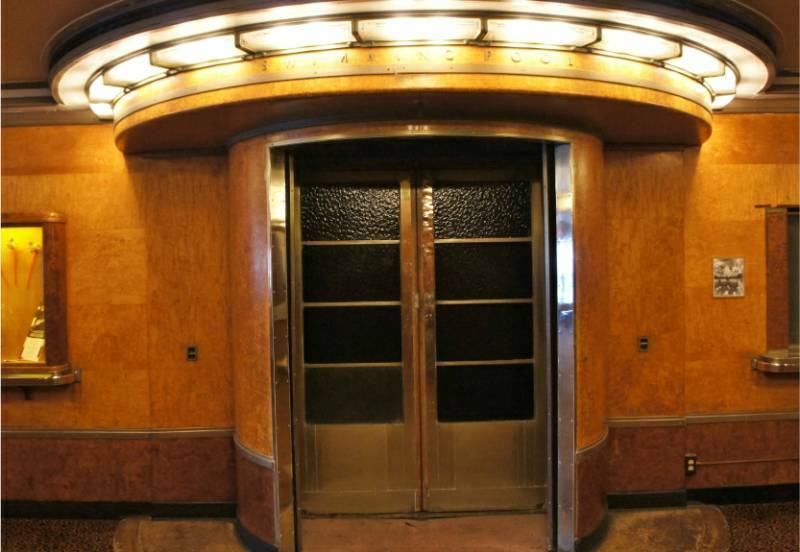 Raymond Subes's superbly decorated Promenade Deck elevator grills; reproduced just as wonderfully as the originals. 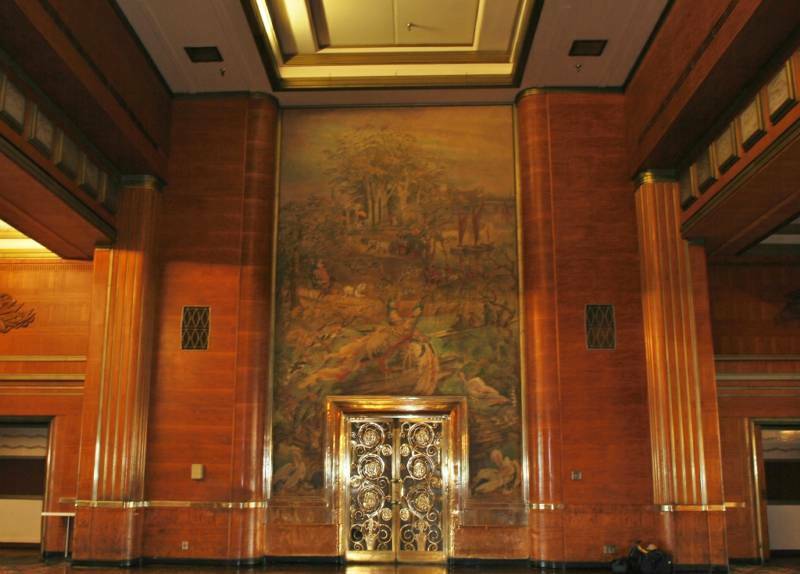 Below, 1st Class Elevator Lobby/ Entrance Hall three decks down was another impressive space. Despite a grey, cold, and wet day, "the Stateliest ship" meets her element for the first time in the presence of some 200,000 people. The date was Wednesday, September the 26th in the year 1934. Authors collection. the first of two ships to maintain the service across the North Atlantic were advancing at nearly the same time as France's hull T6 forming across the English Channel. This was the start of what would become the greatest rivalry known on the North Atlantic since the age of steam began over a century ago. The Great Depression ensued by the Stock Market crash in New York held a overbearing grip over the British nation such that work was halted on the construction of the Cunard ship on December 11, 1931. Thru a campaign lead by David Kirkwood, it became a matter of national importance to resume work on Hull 534- the ship that would eventually become QUEEN MARY. After 27 months of riveting silence, work was resumed on April 3, 1934 with the launching taking place on September 26 of that same year. 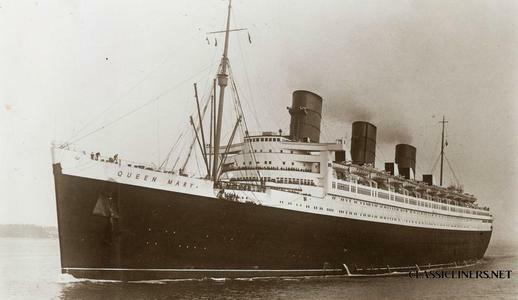 Further fruition of this national symbol of hope and prosperity came about on March 24, 1936 as she took the first steps from her birth place on the Clyde and begin what is known as a most illustrious career in what history calls the 'Golden Age' of the ocean liner. 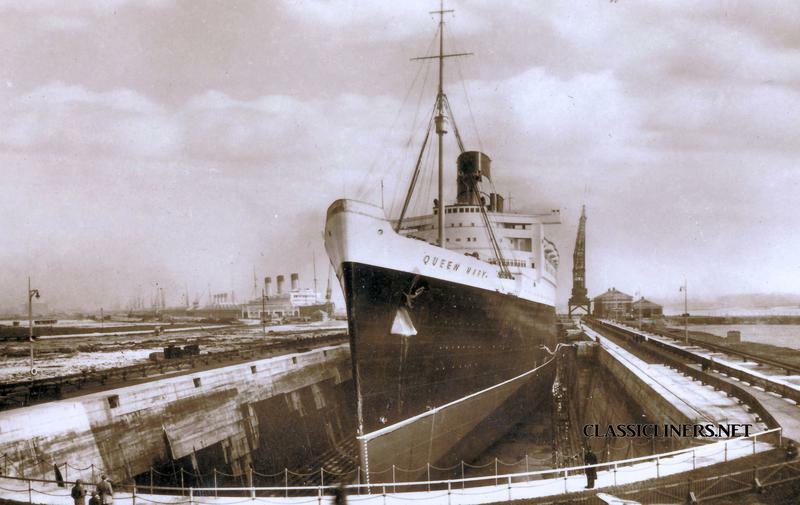 Sea trials took place in the middle of April, and on May 12th, she was officially handed over by the John Brown builders to her owners, Cunard-White Star Line. 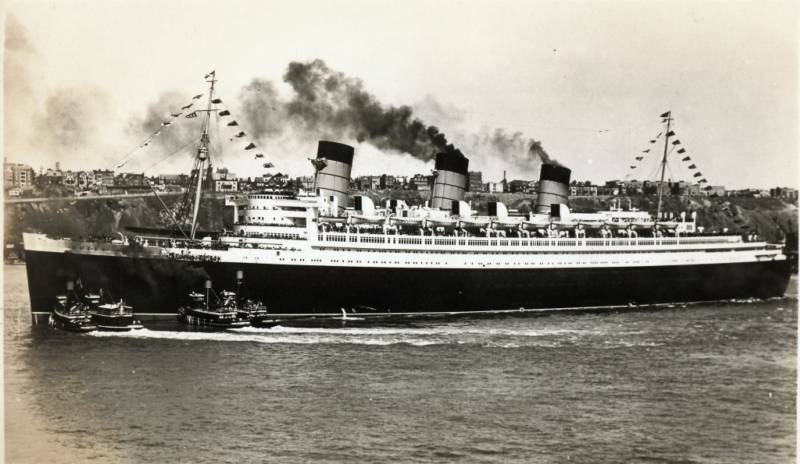 May 27th began the start of the maiden voyage, with an arrival at New York on the first of June, 1936. While she did not take the revered Blue Riband speed record from NORMANDIE, she was poised to do so in her debut year. 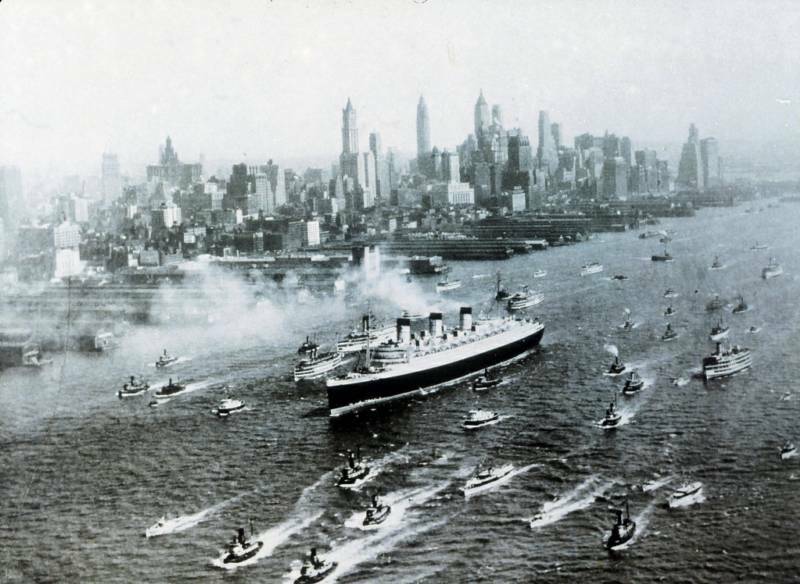 In fact, the two rivals battled out the record until August 1938 when QUEEN MARY proved the fastest with a speed of 30.99 knots (Westbound). Not two years later the ship was sporting somewhat less pleasing colours in which she became very famous for- battleship gray and thusly, the start of her heroic war duties that lasted until September 29, 1946. 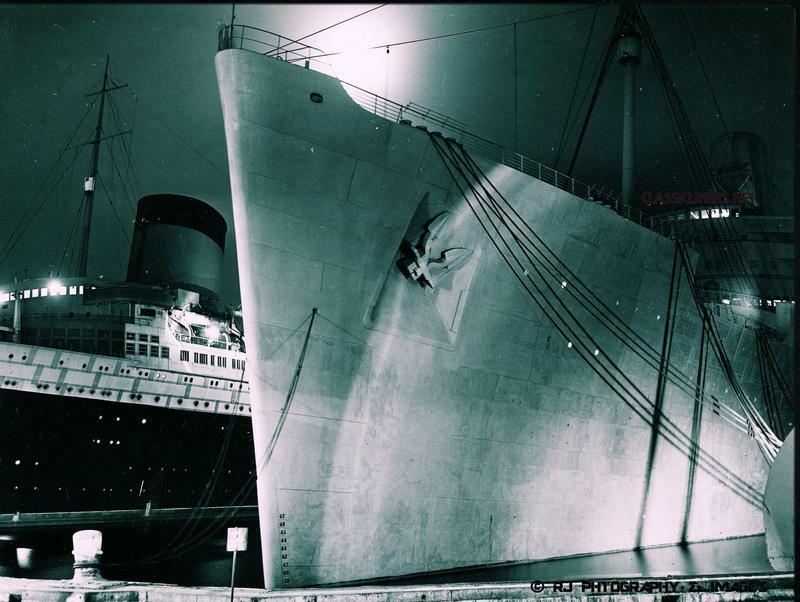 The QUEEN MARY was able to make revolutions for 30 knots and follow zig-zag courses which gave the 1,019 foot ship the ability to quickly disappear from view, especially on an overcast day or one with poor visibility, like a ghost- hence the nickname, the Gray Ghost. The "Gray Ghost" during the war carried some 810,730 passengers and steamed 661,771 miles. 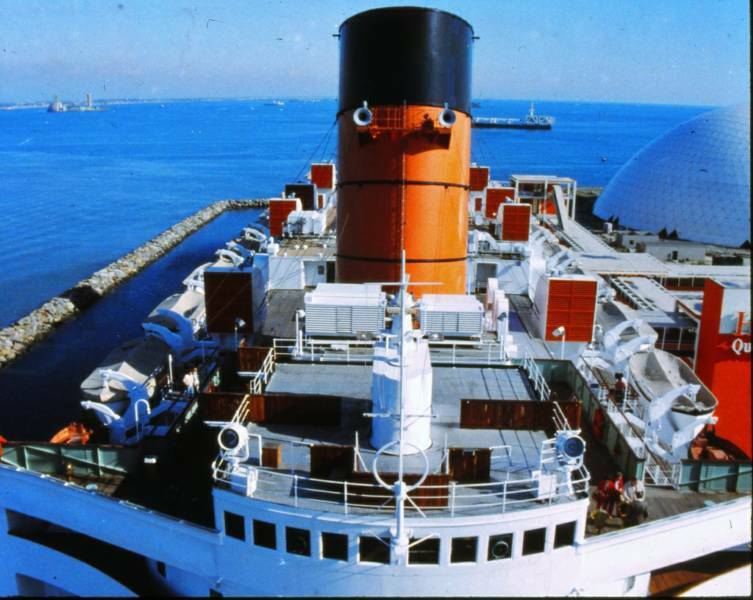 Among the many numbers that are attached to the QUEEN MARY, the greatest number of souls ever carried aboard one ship at one time remain her most significant -16,683. 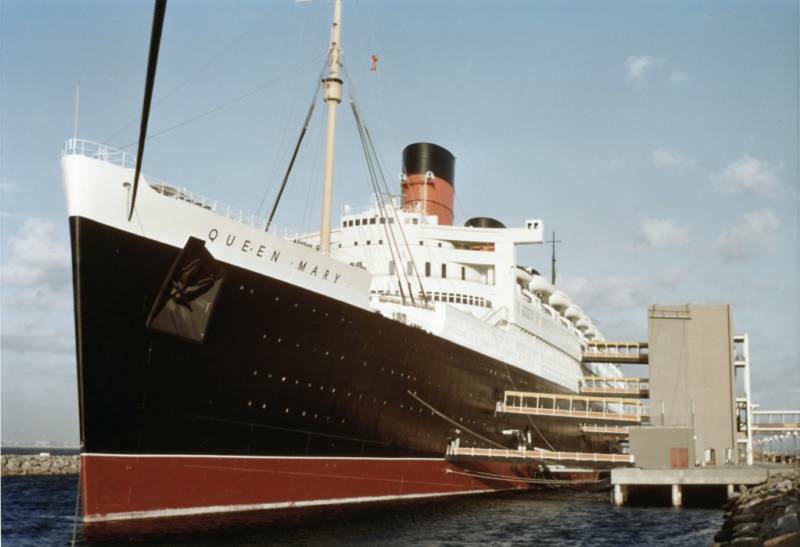 After being returned to service in July 1947, and joining her sister, the QUEEN ELIZABETH, the two Queens ushered in Cunards' most profitable decade in their history. No two other ships could be said to be of equal in service and success than the two Queens. 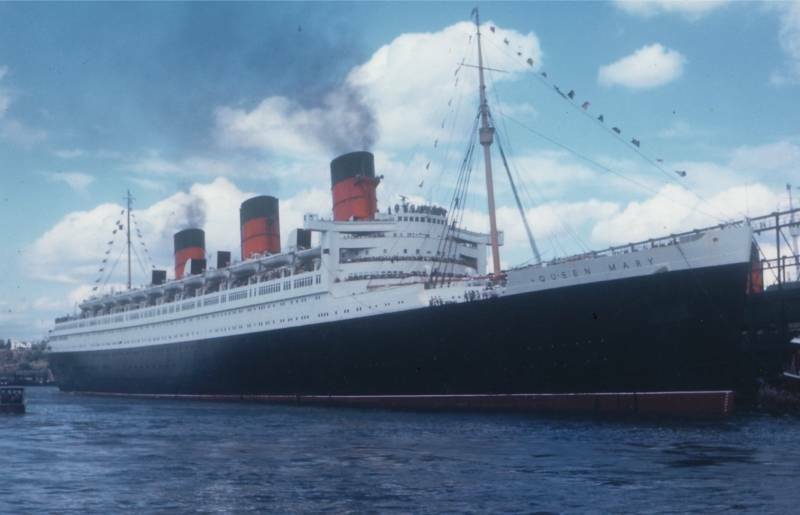 But it would be the last decade that ocean liners like this would bask in the glory, for in the skies would lurk competition that would seriously question the future of not just the two liners, but of ocean liners in general. Many of the same ships in that decade of the 1960s struggled and many simply had to adapt to perform more cruising in tropical settings or be sent to the scrap yards. 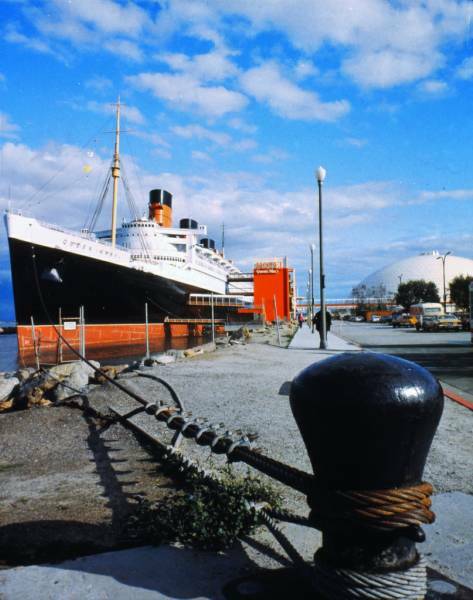 Cunard was losing millions each year, coupled with labour unrest, and rising fuel costs, the decision was made to sell both Queens. Thankfully, both luck and the Queens popularity placed both 1,000 foot ships in static roles. 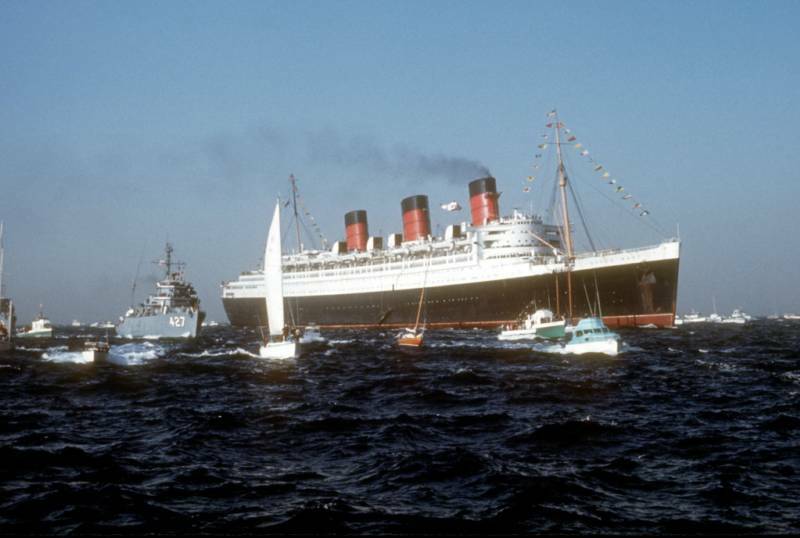 One of the West coast of Long Beach upon her last voyage in 1967, and her sister on the East coast of Florida upon her retirement in 1968. Static roles with ships, especially the size of the Queens, is almost always a risk and takes a great deal of planning and funds to remain viable. 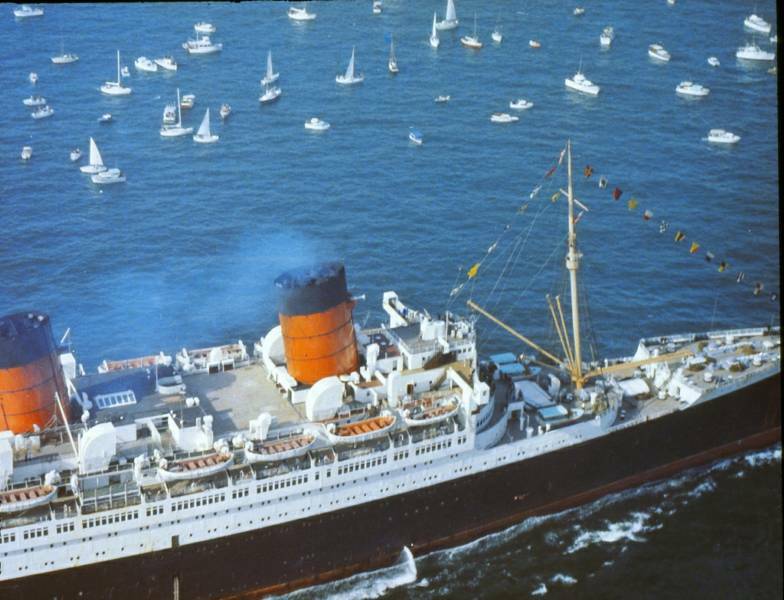 The finanical backers of the MARY faired better than her sister ELIZABETH, which were at best, shady, and in the end wound up being Cunard Line itelf until her sale to a Chinese shipper in 1970. QUEEN MARY has thankfully managed the cruel fate that befell her sister, but her preservation contines to be a prority in the face of owners who seek to make a profit. 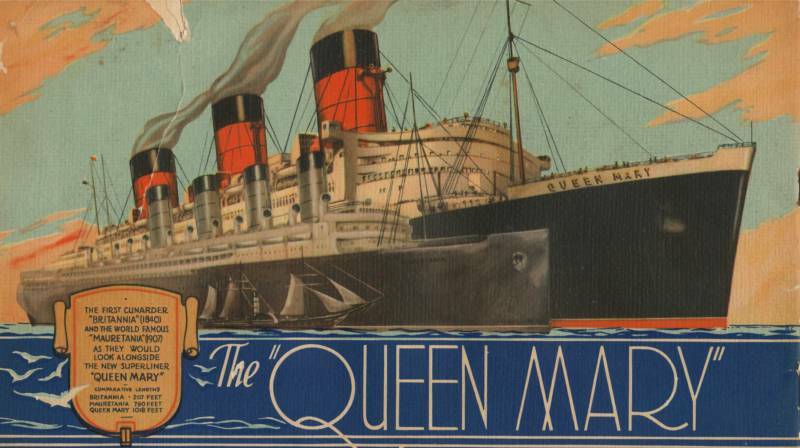 No doubt, her popularity continues as many come to understand the magic of this 'Queen of the Seas,' surely intriguing countless many guests of the romance of the ocean liner era. MARY is eased from her birthplace and thousands looked on as seen at the left. Millions of cubic feet of the river bottom had been removed prior to ensure the vessel would not ground. Notice there are no lifeboats except two all the way forward to make her as light and with as little of the ship in the water as possible.